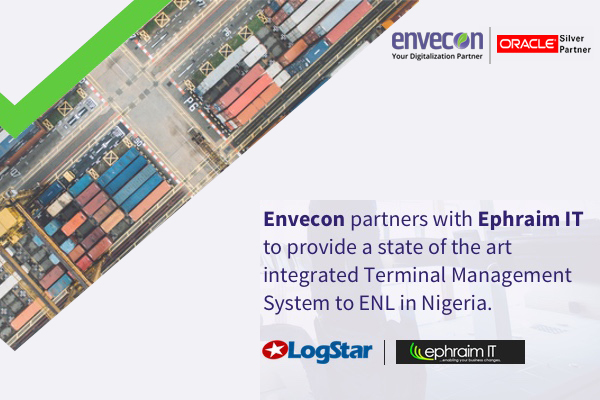 Envecon and Ephraim Information Technology (Ephraim IT) have teamed up to provide a state of the art integrated terminal management system to ENL Consortium Ltd.
Envecon will provide LogStar, a solution for all General Cargo Terminal Operations and Ephraim IT will deliver Oracle eBusiness Suite Finance, a financial management application to the client. The solution will be made available soon on the Oracle Cloud Marketplace to support existing and new Oracle customers in the transport and logistics sector. In a statement by ENL, “Our choice of Envecon & Ephraim IT is based on the track record of the companies and the provision of efficient technology services across the globe. ENL is constantly seeking innovative and cost effective ways to manage its business operations to gain visibility, control, and develop real time actionable insights in the end to end value chain process. We expect to get value from our investment in terms of efficiency, cohesiveness, durability and competitive service”. Envecon is a digitalization partner for its customers dedicated to providing industry-specific ERP business services solutions for asset-intensive industries. Headquartered in Denmark, Envecon has become a trusted and reliable partner providing 100+ successful implementations since the last 8 years in more than 50 countries worldwide. Ephraim IT is an IT service and solutions provider and an Oracle gold partner. Ephraim provides IT consultancy, and management services to its customers. Founded in Nigeria, Ephraim IT has been serving satisfied customers for the last 8 years across the country. ENL Consortium Ltd is headquartered in Lagos, Nigeria and has interests in Shipping & Ports, Construction, Mining, Power, Quarries, Real Estate, Software Development, Food Shops and General Services. ENL Port is a multi-purpose facility located at Terminals C & D of Apapa Port where it has been the operator and concessionaire since April 2006.